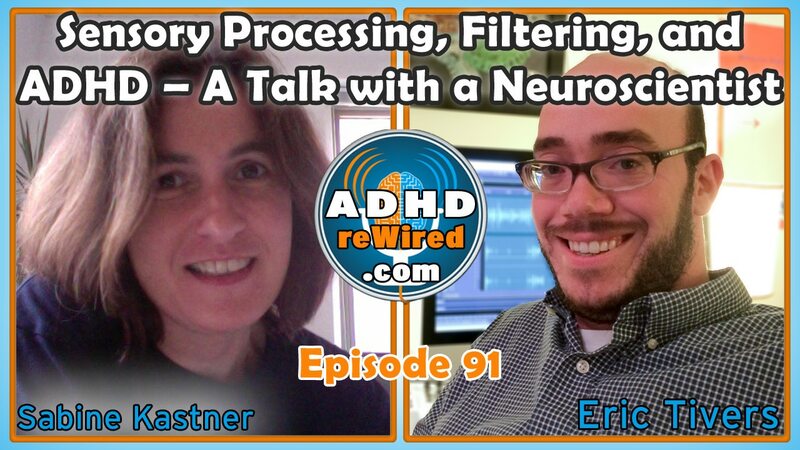 A Princeton professor of neuroscience and psychology, Dr. Sabine Kastner talks in-depth about the mechanics of sensory processing, filtering, and the brain’s attention network. Currently on the forefront of many forms of ADHD research, Dr. Sabine discusses her theories on emerging results and provides a great insight into the interesting and complex work under way. A professor of neuroscience and psychology at Princeton University’s Neuroscience Institute for the past fifteen years, Sabine is also the scientific director of the Scully Center’s neural imaging facility. Sabine’s main focus of study lies in the neural basis of visual perception, attention, and awareness in the developing and adult brain. Publishing over one-hundred articles, journals, and books, Sabine’s work includes The Oxford Handbook of Attention, a comprehensive field reference. Since the start of her career thirty years ago, Sabine has studied attention and attention selection, mainly from a visual standpoint; she is a vision scientist. One of Sabine’s goals has been to better understand how the brain functions when managing the visual clutter of our daily lives and the differenced therein between those with and without attention deficits. Beginning her college education studying history and philosophy, Sabine was very interested in questions of consciousness and how people become aware of the world and their existence. This lead her into topics of brain–mind relationships. Attending a lecture on the relationship between neuroscience and philosophy given by her future PhD mentor, Sabine was amazed. This drove her to realize the best way to answer her questions would be through experimentation and exploring processes in the brain. Switching to studying for her PhD in neuroscience, she focused her studies on vision and attention, which were suggested to her as the closest she could find to philosophy. The brain’s “attention network” is an underlying network linking most major lobes, including the sensory processing areas. In particular relation to ADHD, this attention network links together the selection of information and the filtering of unwanted information. Sabine feels that, when looking at ADHD, people should be looking beyond the qualities of focus and selection – filtering of information is also very important. Each process depends on and interacts with the others. This interaction has not been emphasized enough, according to Sabine. Also, seeing a lot of emphasis on the potential failure of the brain’s control functions as an explanation for the symptoms of ADHD, Sabine posits that the sensory information may instead exist but in a different form that is incompatible or less compatible with the control mechanisms of the brain, leading to them working less effectively or failing. Recent research shows that the attention networks of those with ADHD are not as tightly interconnected and are under-activated compared to those without. At which particular level of brain function processes go wrong is one of the major focuses of the research Sabine and her colleagues are involved in. That point could, too, be different for different people – some could have more of an executive functioning problem while another could have more of a sensory processing problem. Addressing people on an individual level is very important. While the attention network of someone with ADHD may be dysfunctional, because it has so many various parts and components, the variables on the individual level are likely to be great. Eric notes that the diagnosis process for ADHD allows for around 86,000 different combinations of symptoms. Eric: The ADHD brain tends to prioritize tasks according to proximity, not importance. Using objects on her desk as examples, Sabine highlights her computer and phone. Absent any sort of motivation, when someone views both the computer and phone on their desk, their brain will begin to compete the objects against one-another to determine their importance. This happens automatically in the brain and between all objects in the world. After setting the task of making a phone call, our brains would normally enhance and strengthen the representation of the phone while diminishing and weakening that of the computer. One is selected and the other is filtered. This process of selection and filtering can only work following the initial state of competition. Sabine is currently exploring whether these processes of competition are properly set-up in those with ADHD. Eric poses an analogy using his hand: holding up your index, middle, and ring finger, think of your index and ring fingers as the inhibition networks and the middle finger representing your attention network – when your inhibition networks don’t work and are guided away. . . There are normally interconnections between one’s inhibition and attention networks; for those with ADHD, those interconnections don’t seem to be present. Eric: Those with ADHD need to be more intentional with their self-talk, directing themselves intentionally both toward what they want to do and away from what they don’t want to do. Reminding oneself of both – what one is and isn’t supposed to be working on – can be a good strategy. In those without ADHD, task selection and filtering are paired “for free”, while those with ADHD have to direct them both individually. Sabine mentions talking with someone at a social gathering as an example of filtering: one has to filter out the background noise and chatter. On the other hand, inhibition is higher level of control involving, for example, stopping oneself from diverting from a task that has been started. From the perspective of looking at the brain, filtering and inhibition can become problematic in the same way. The major differences are in the level of intensity and involving other sensory networks. Through learning how to deal with sensory information at a basic level – as when one is a child – the brain then develops the processes of selection, filtering, attention, and inhibition. In Eric’s experience with those on the autism spectrum, he found that people won’t begin to learn until their sensory systems are first regulated. Prior to about twenty years ago, those in the field of attention studies would mainly discuss behavior motivation and task-relevant information. After that time, they began to realize the utility of looking at the tremendous amount of information the brain filters out. Sabine’s hypothesis, regarding the brain competing objects and subjects against one-another, is that for those with ADHD, the competition is not set up at all. If that hypothesis is correct, then retraining the sensory processing systems (visual, auditory, etc.) on a basic level would be necessary. Sabine: “We need this kind of concrete research at this moment in time to really characterize what’s going wrong in the ADHD brain.” I think what we’ll see is a large spectrum that, in some individuals, will have a strong sensory component while not in other individuals. Sabine’s son was diagnosed at age six with neurodevelopmental challenges in the area of motor coordination, called dyspraxia. Dyspraxia is mainly concerned with coordination-related tasks like biking, swimming, using utensils, and writing legibly. Because of a lack of motor memory, those with dyspraxia will use other types of memory to compensate, which can impact academic performance. Dyspraxia is often hard to spot, as many children with it are thought to just have poor handwriting and coordination. Sabine tries to bring together a wide array of people in the neurodevelopmental field, such as school psychologists, child study team members, teachers, occupational therapists, and physical therapists to help gain a better overall understanding of the associated disorders through their different perspectives. Knowing what is wrong with a person’s brain is important, but in order to develop programs to help people living with these challenges, perspectives from those who deal with a wide variety of those people on a regular basis is essential. Through participating in various social networks, Sabine has gained a lot of perspective and knowledge. She encourages people to continue to expand these networks and take advantage of the ability to form communities of people to help each other. Sabine: In ten years, ADHD won’t be a psychiatric disorder, it will be diagnosed on a behavioral, neurological scale. The major cognitive networks of the brain (attention, language, memory, etc.) appear to use resonance frequencies to communicate. Similar to how there are different radio stations that a radio can be tuned to monitor, each cognitive network would have its own frequency through which it communicates. There are also frequency bands used to communicate between networks. In those with autism and schizophrenia, people’s resonance frequencies tend to be offset, which could be causing communication problems in-between their different networks. Some emerging evidence shows the possibility this could pertain to ADHD as well. Perhaps bringing one network’s resonance frequency more in-line with where it would normally be could aid in absolving certain symptoms. Most people will naturally begin moving to a particular beat and do so in-rhythm. Sabine’s son, however, could not maintain a rhythm. She surmised that this could be because of a disconnect between his auditory and motor system’s resonance frequencies. Re-training the motor system via drumming and music might be a way to begin to remedy this, though it’s just a guess. For Sabin’s son, drumming has worked well; for those with a larger motor component to their ADHD, it may be worth it to try as well, she says.